The new Harbor House consists of two buildings. One is it a restored former fire station. The other, an impressive beam-shaped construction that is by any standard—past or present—a truly remarkable sculptural form. This elongated volume is approximately 100 meter long, up to 25 meter wide and a striking four stories high. 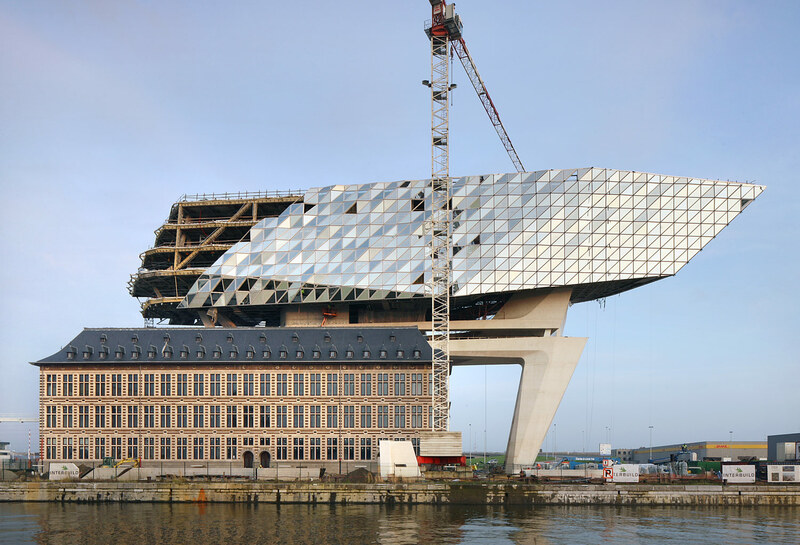 The construction consists of a torsion-free steel structure that enables a pointed and eccentric support. The underlying concept—necessary to achieve a stable construction—consists of two parts. 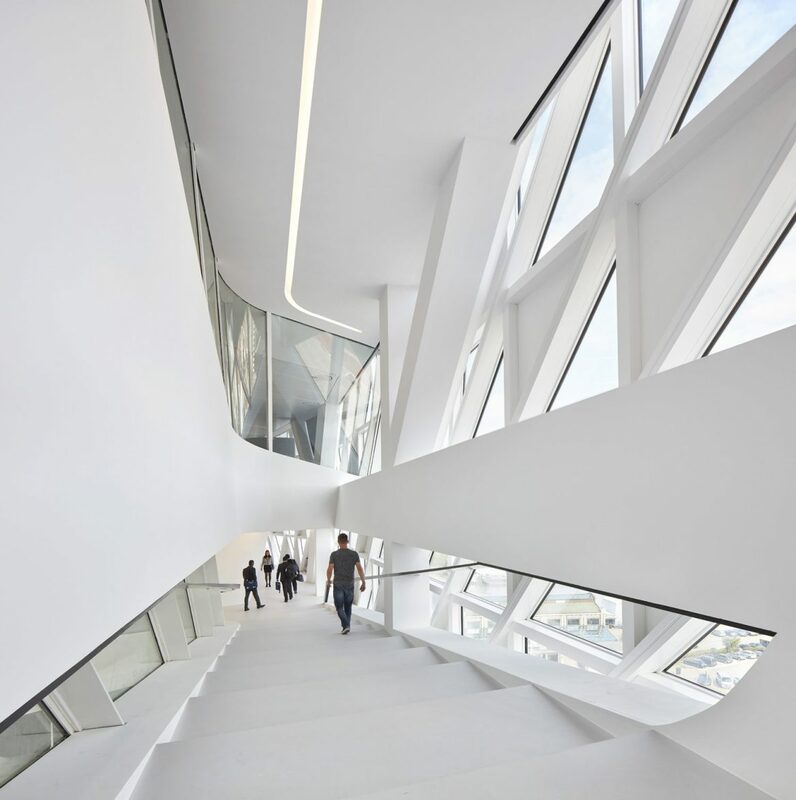 On the one hand, a concrete element in the form of a trapezium-shaped ring encloses the south wing of the existing building in a vertical direction. On the other is a four-legged steel structure, bent rather like an opened paper clip. 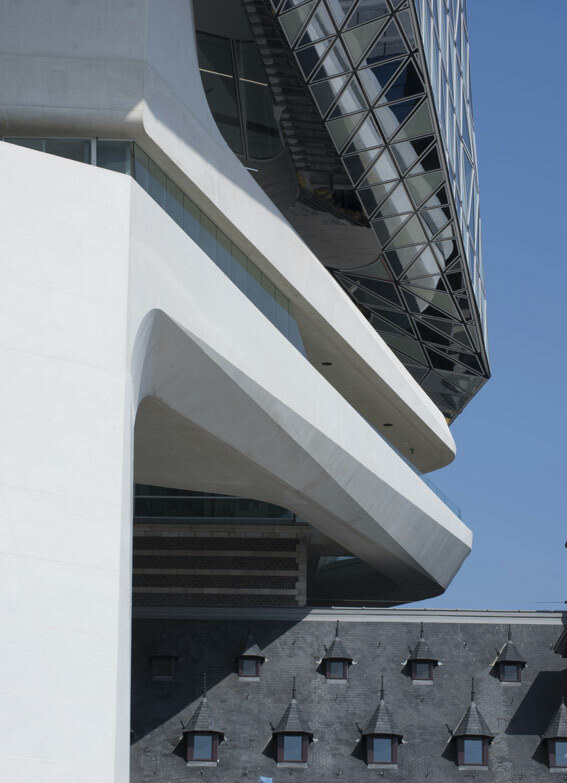 The most prominent and indeed the main part of the concrete ring is the inclined concrete front-leg located in front of the building. At the top of the front-leg an inclined Vierendeelcell is the connecting element between what some observers have called an engine hood and the bridge. It has been precisely engineered to be sufficiently rigid in its plane to transfer the lateral forces of the wind on the new construction to the inclined front-leg. At the bottom, the front-leg is laterally fixed in the foundation. 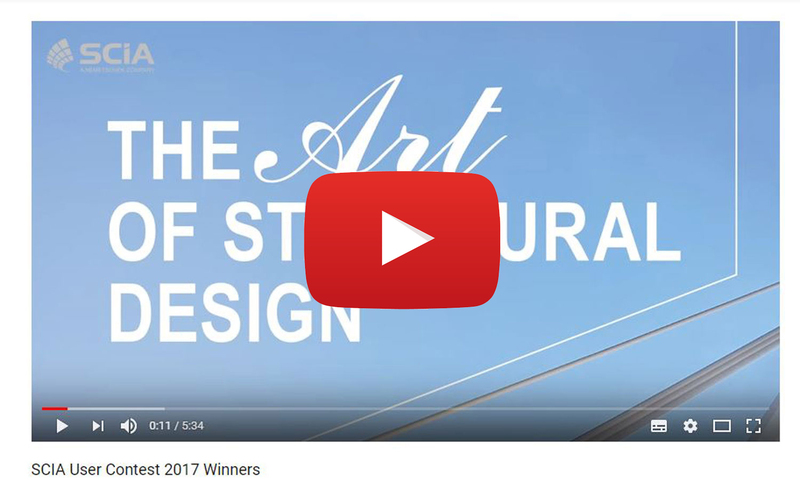 The bridge linking the front-leg with the concrete core in the atrium simultaneously functions as a tension member and as a tubular frame. It is situated at a height of 20.5 meter above the wharf and spans a distance of 32 meter. 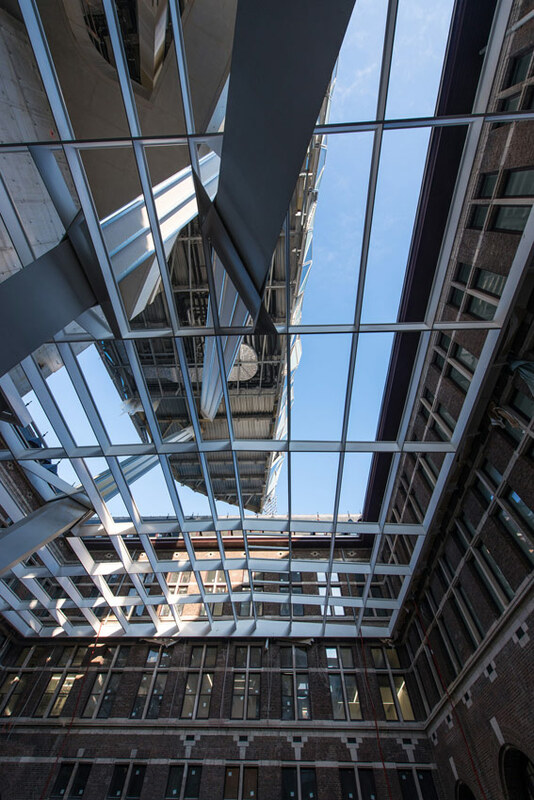 The other structural portion, referred to previously as being rather like an unfolded paperclip, consists of four legs piercing through the glass ceiling above the atrium of the existing building. Two curved points of the clip rest on the ground of the courtyard. The third bent point is visible in the ceiling of the first floor of the new volume. Their position has been chosen in order to deliver the vertical (weight) and horizontal (wind) forces to the foundation in the optimal manner. Meanwhile, the legs literally shape the space and give a spectacular dynamism to the design. The new volume starts at 28 meter and soars to a height of 44 meter. 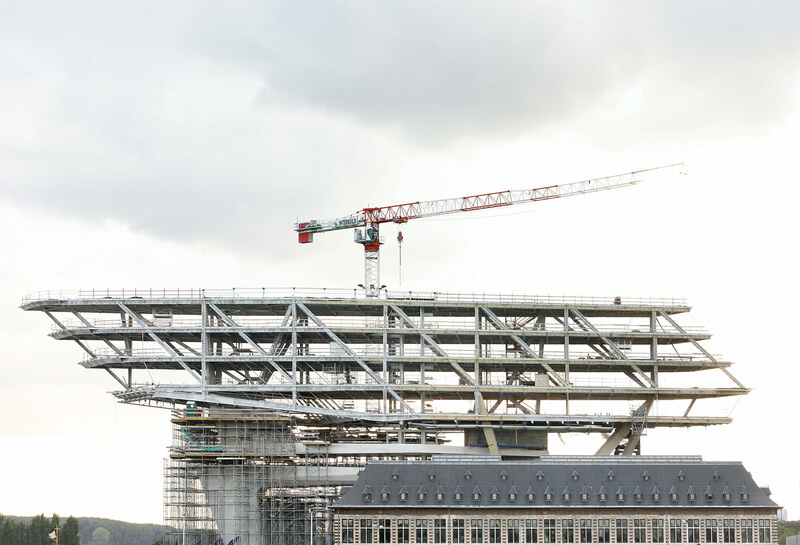 It consists in part of a middle truss and two angled facade trusses. The lowest floor hangs from the three main trusses. The two facade trusses join with the roof and floor truss forming a stiff hollow tube. Four internal transversal trusses stiffen the tube. They are scattered throughout the tube, but are not positioned at the end faces in order to retain the frontal facades clear of structure. At the south side, the facade is inclined upwardly. The highest point cantilevers 36 meter with respect to the footprint of the front leg. The former fire station was thoroughly restored. Although the exterior of the existing building has a uniform character, the interior was highly fragmented. The structural changes in the building involved reinstalling the original basic structure. For example, the east and west wings were rearranged in open areas, making them particularly well-suited for landscape offices. 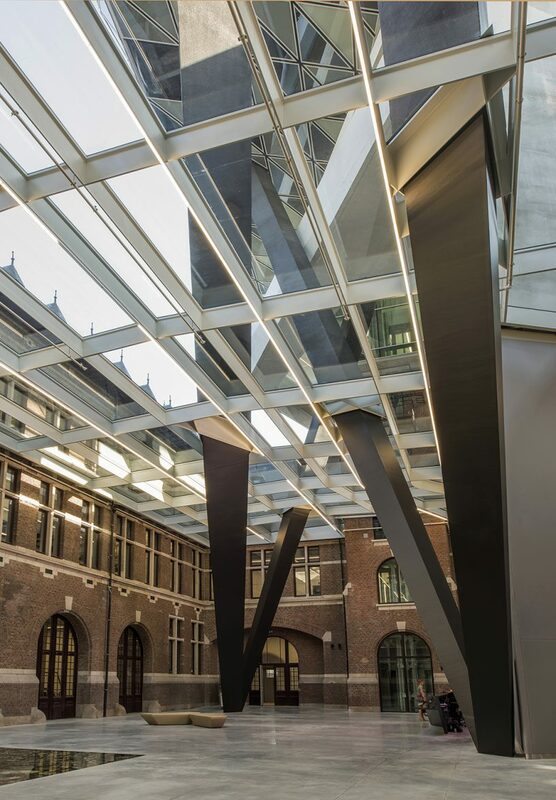 A glass roof covers the courtyard of the existing building. The viewer discovers the spectacular upper structure through this glass ceiling. The steel frame which supports the glass is conceived as a grid of welded T-shaped beams. A welded torsional steel tube of 110 mm width is integrated around the existing building. It transmits the weight of the roof via thin steel plates to the existing masonry. A two-story parking garage is located under the forecourt. Both the intermediate and the roof plate are a massive flat slab floor which rests on concrete columns and walls. A modeled passage in concrete makes the connection between the underground parking and the existing building, ultimately arriving in the atrium. 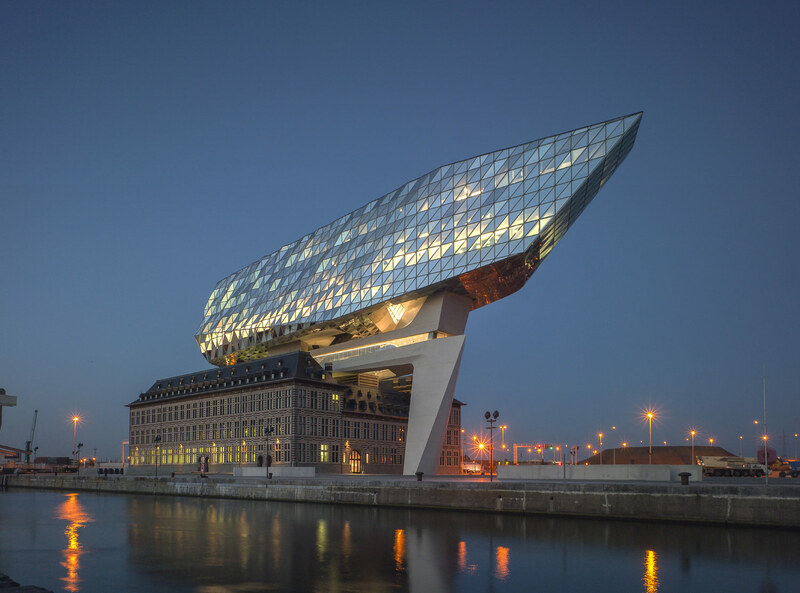 The pronounced design of the walls and the underground portion of the front leg are an ideal introduction to the building and to the idiom of architect Zaha Hadid.